Long Ago and Far, Far Away . . .
Well, can we see what you did with your Briar Rose Collection? Of course; remember, I was only given a charm pack (that means: 5" squares). Are you ready? 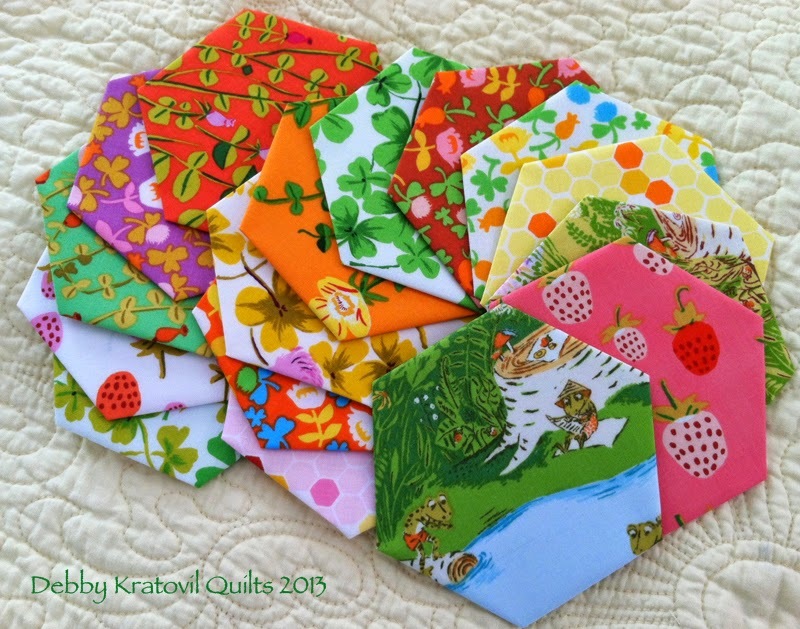 And what can you make with 5" squares? 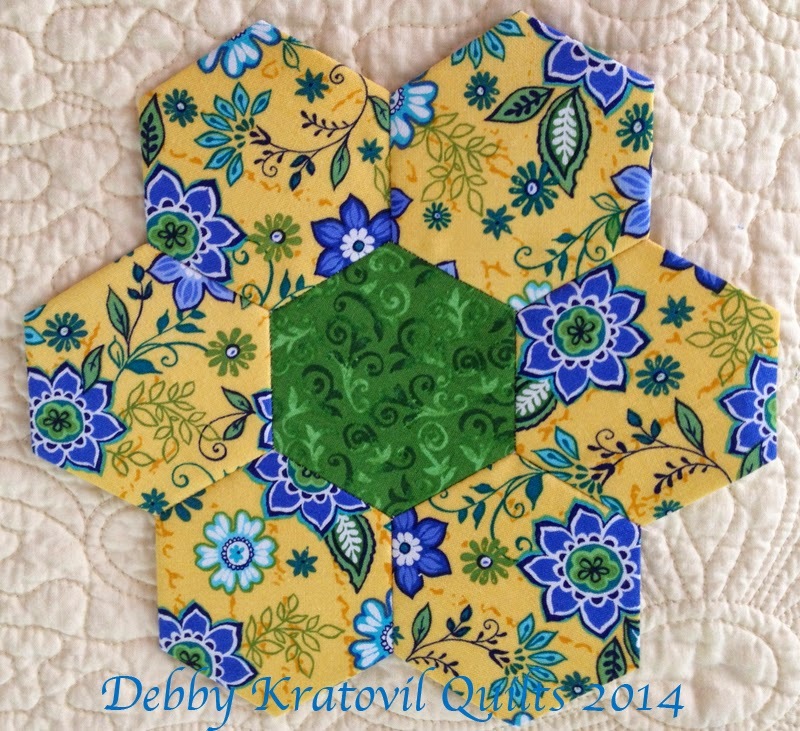 2" English Paper Pieced Hexies! Now, where's that AWESOME quilt, you ask? I'm glad you asked! A few days ago I blogged about this collection and showed it in the Happy Hexie Table Runner. Do you remember it? I found an Etsy store that sells the pattern; you can see it in a different colorway. And it's only $4.00! 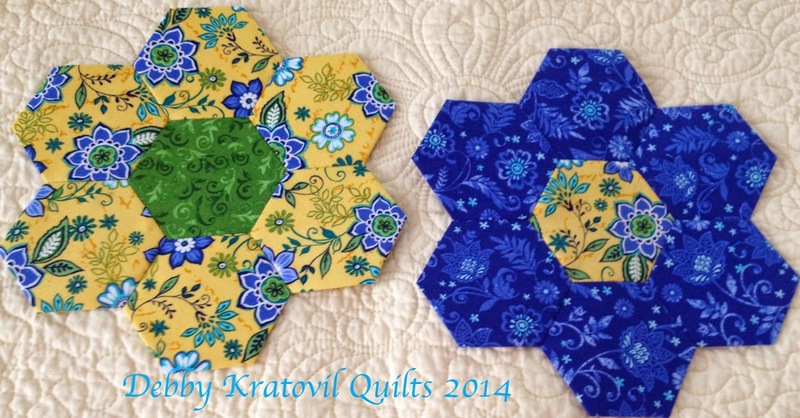 I cut several patches to make some other hexies, this time using English Paper Piecing. What do you think? Well, can we see each one please? What if I reversed the color placement? I have absolutely no fabrics left. 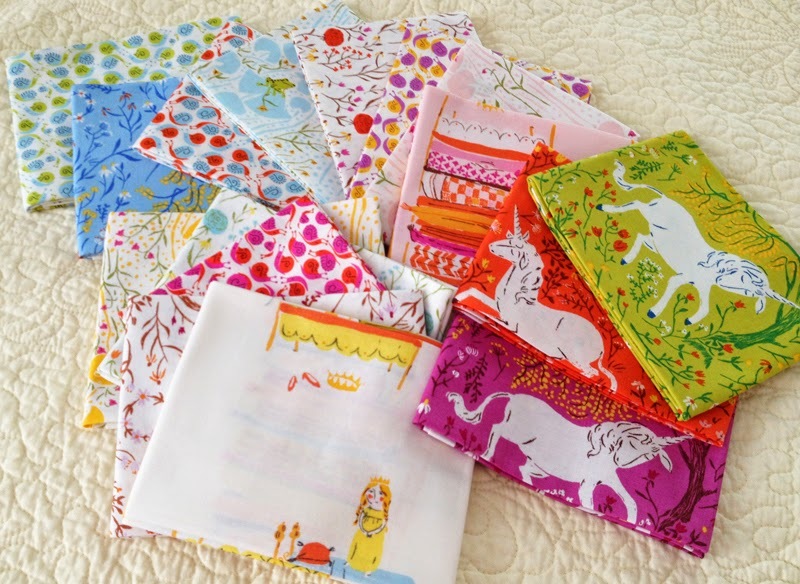 I squeezed the life out of the fat quarters I received for these little samples. I love being able to take this hand work with me when I travel. 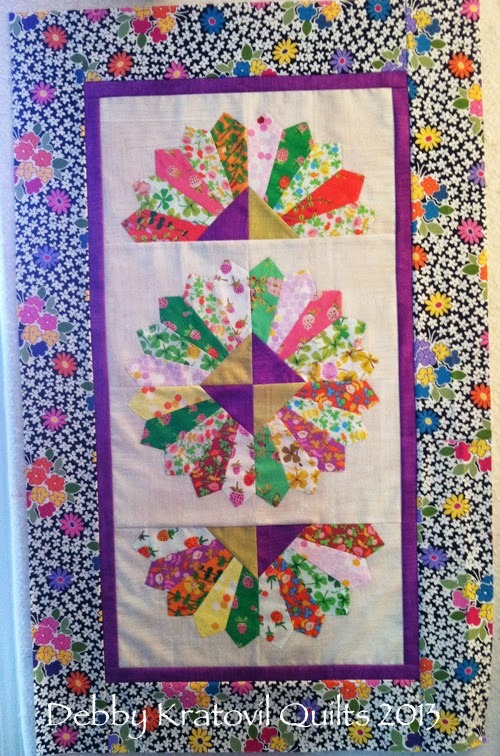 Stay tuned for some other Grandmother's Flower Garden blocks done in a larger size and in a different set of fabrics! 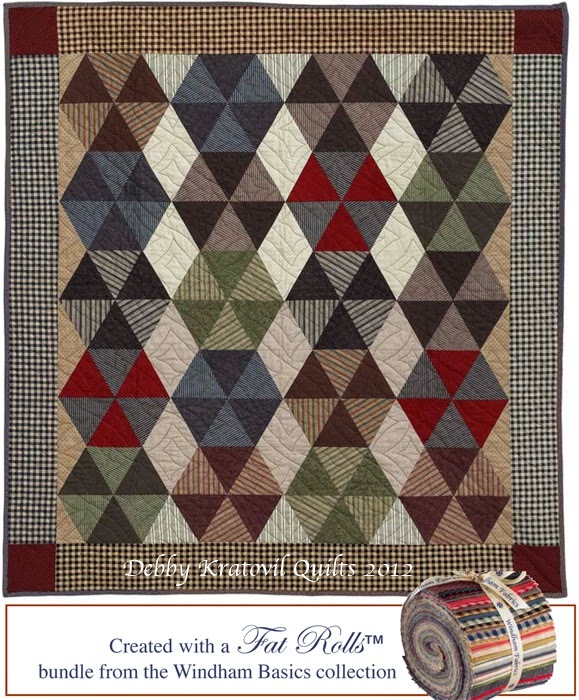 Remember yesterday's Casablanca Sunrise quilt (red)? 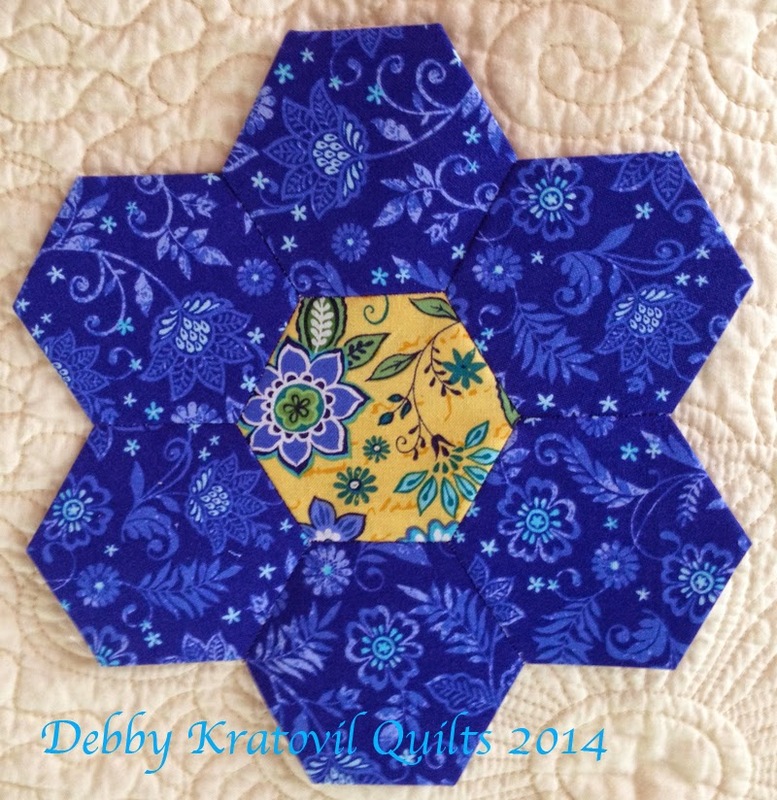 This is the same collection using the blues and my popular pattern by Cut Loose Press: Happy Hexie Table Runner. I love this quick and fun project. And you can cut those hexagons from a regular 60 degree ruler! This collection is bright and bold. 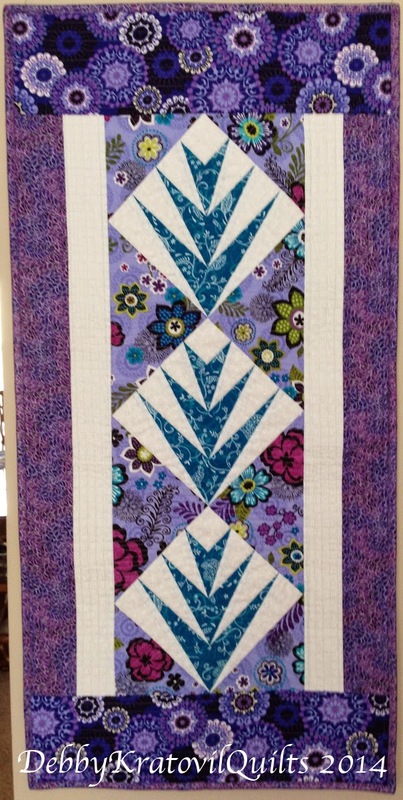 I used my 7" Palm/Hossanah foundation pieced block to make a wall banner (or even a table runner). I quilted it in straight lines in the borders. This collection is called Angelica. I have made this pattern several times using my teardrop template from my EZ Double Wedding Ring templates. Makes a bold statement with such fabulous stained glass printed fabric. Small projects are quick and easy and great teaching samples. Tomorrow (Saturday May 17) I will have a book signing in the Blank Fabrics booth. My publisher, Martingale, is supplying the books and all I have to do is smile and sign! And I will have quite a few blocks and other samples sewn from the book for the conferees to see up close. Thanks for letting me share my quilts. They like the publicity and are so happy to spend a few days OUT of the closets. 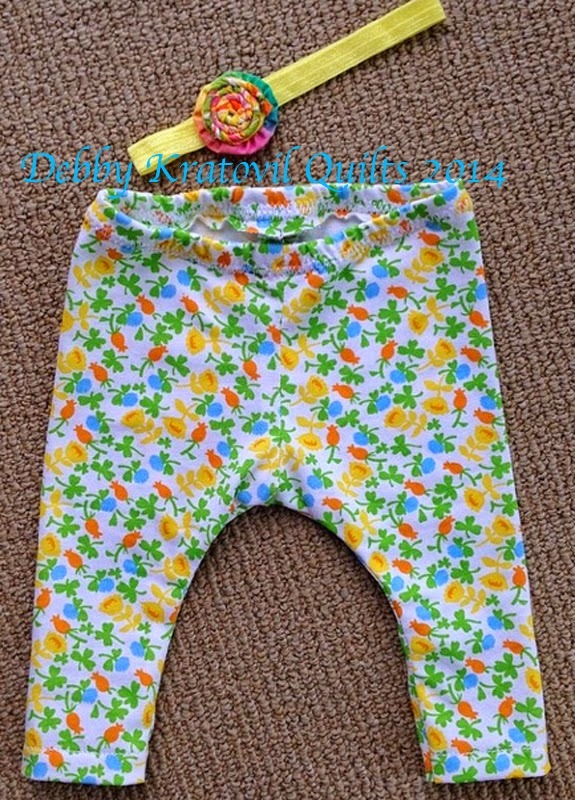 I have been happy to just sew! Off to Spring Quilt Market for a few days. Showcasing new fabrics using my own patterns. 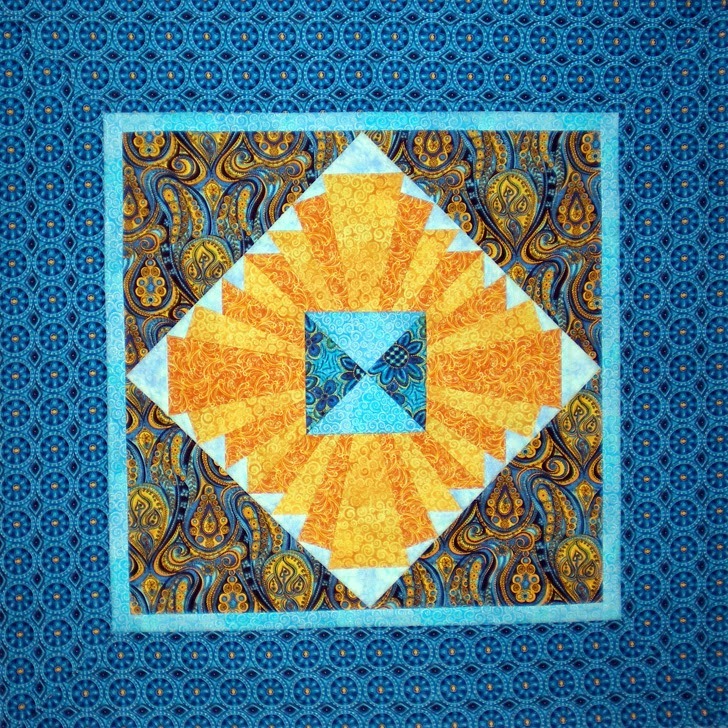 The Casablanca Sunrise is from my book (Paper Piecing Perfect Points). See how it looks in other fabrics! Four blocks give the illusion of five. I sewed until I ran out of fabric! This basic pattern is the traditional Rising Sun block from the early 1900s. Takes on today's feel with today's fabrics. And so much easier using paper piecing! 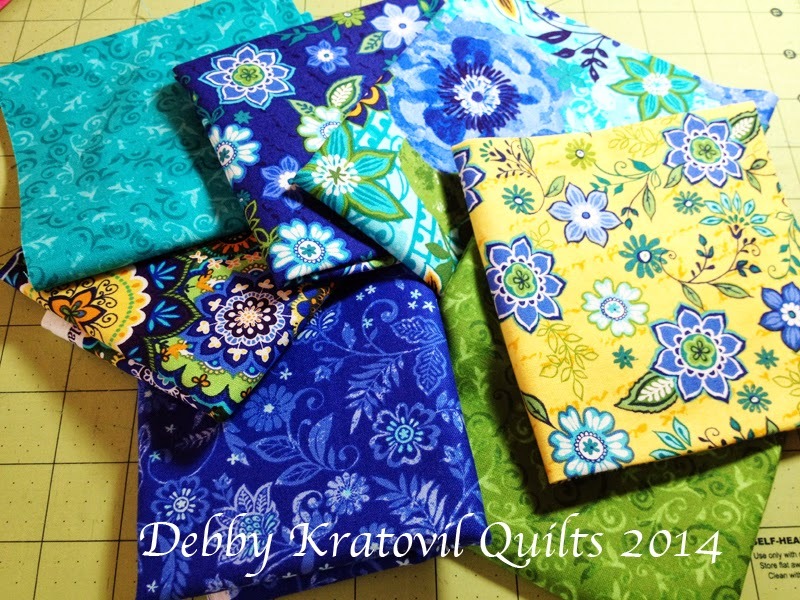 How about some free quilt patterns to go with your ever increasing stash of fabric? 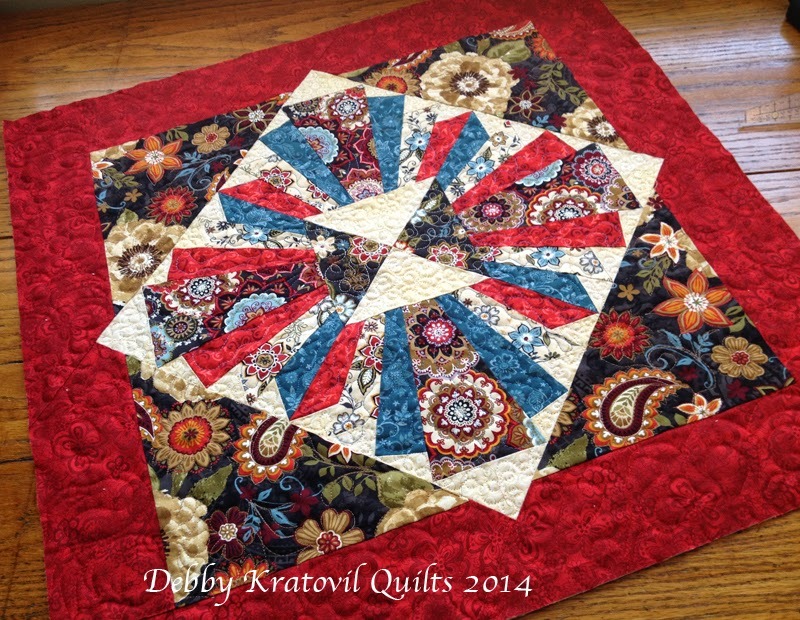 My Hexagon Pinwheels pattern, made with Windham Fabrics "Fat Rolls" (isn't that something happening around my midriff these days?!! 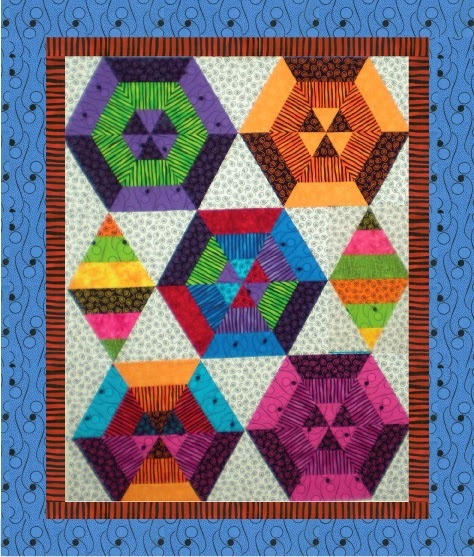 ), is a very fun scrap quilt. 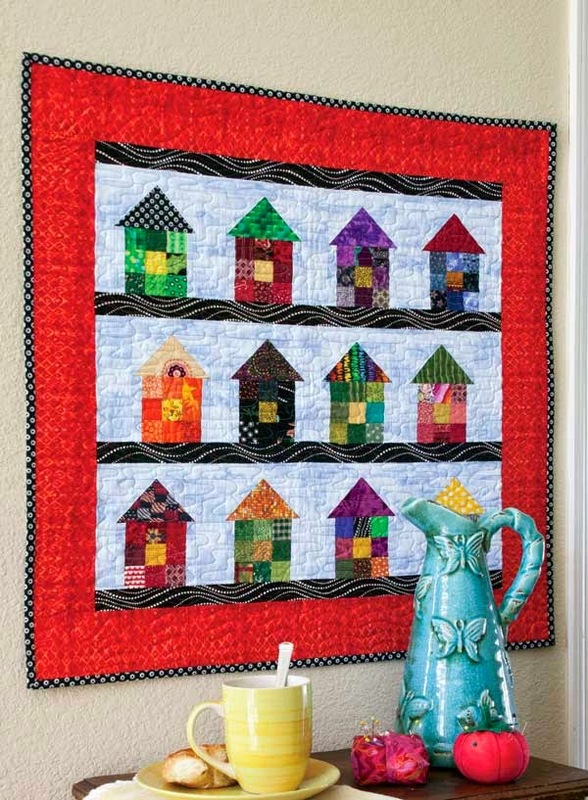 Martingale (my publisher for books and the perpetual Quilter's Block a Day Calendar) is featuring 18 of their authors today and every one of us is offering a FREE pattern. Wow - is it Christmas again so soon? The Fat Rolls are a bundle of 5" strips that Windham created a few years ago and they asked me to make something using their Basics Collection. Don't you just love those plaids? The templates are included in the project sheet, but if you have a 60 degree ruler, you can quick-cut these. And I include an easy way to sew two strips together along BOTH long sides (into a tube) and then using a 60 degree ruler, you cut out triangles two by two. So, go on over to the Martingale site and see what the other 17 authors are giving away. I'm sure there is so much inspiration that you may actually make a sizable dent in your stash! One Day Lone Star - Oh, Yes it Is!!! The red suitcase is back out, the dog is nervous, and I leave tomorrow for a guild in Tennessee. Teaching two workshops (and present a trunk show). One of them is the One Day Lone Star. Yes, I said that correct: One Day Lone Star! That is my workhop for Saturday. Well, what's happening on Friday (besides the trunk show)? Yes, that's the name of the block in this quilt. 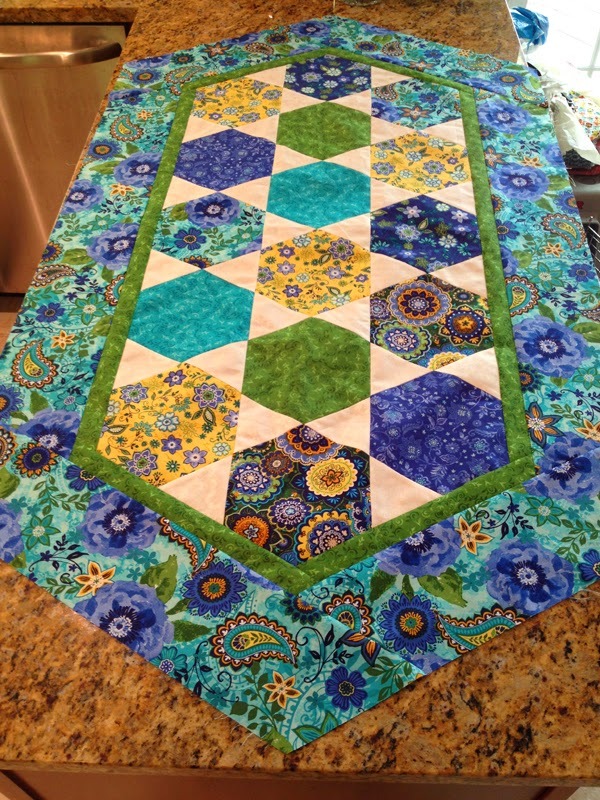 Easy to name the quilt if you know the name of the block, huh? Cut two strips; sew together; recut and make the four units of the block. No templates; no lopped off points; easy and FUN! I teach this on Friday afternoon. Leave tomorrow. The dog is edgy. Husband is on his own. Looking forward to June when my schedule slows down and I feel a bit more human! But my quilts are OH, SO HAPPY to get out of the closets and some attention! 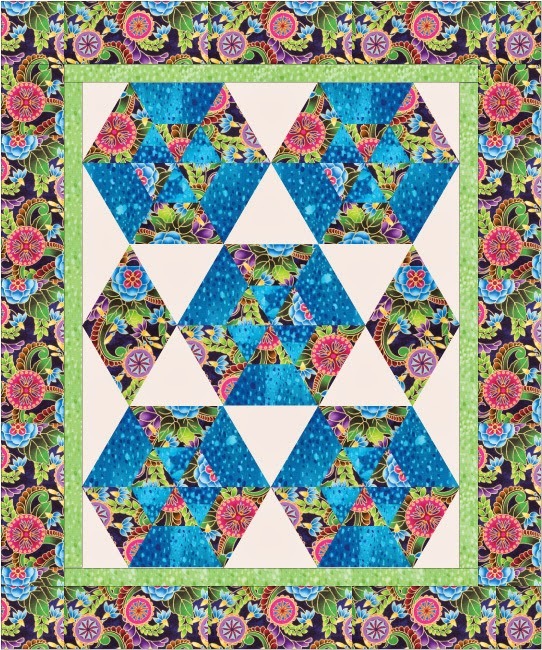 The Quiltmaker's 100 Blocks Blog Tour is over, but I wanted to share with you a very fresh looking block made by a quilting friend of mine, Aby Dolinger. 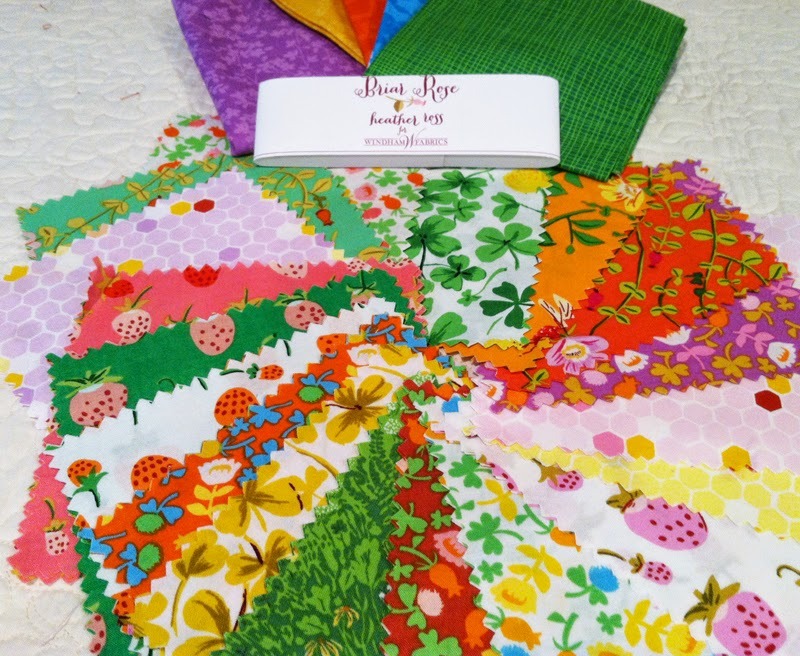 She is a very creative person who also has a longarm business. She shared my block the other day on her blog and I had plans to remake her block to share here, but being sick all week has slowed me down (I'm on the mend). I love that she kept her palette simple, though there is a variety of prints involved. 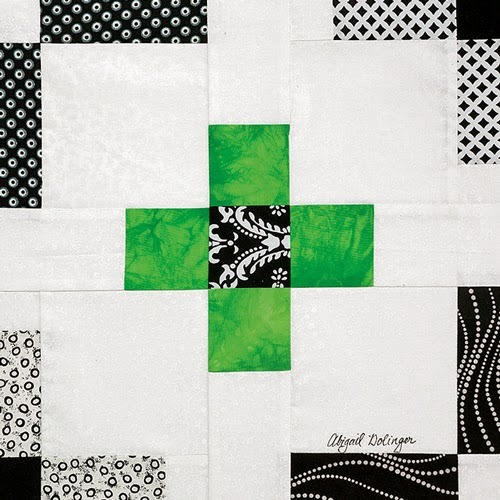 The large white patches serve as a frame around that green cross. That green is my very favorite color because it yells "SPRING IS HERE!" 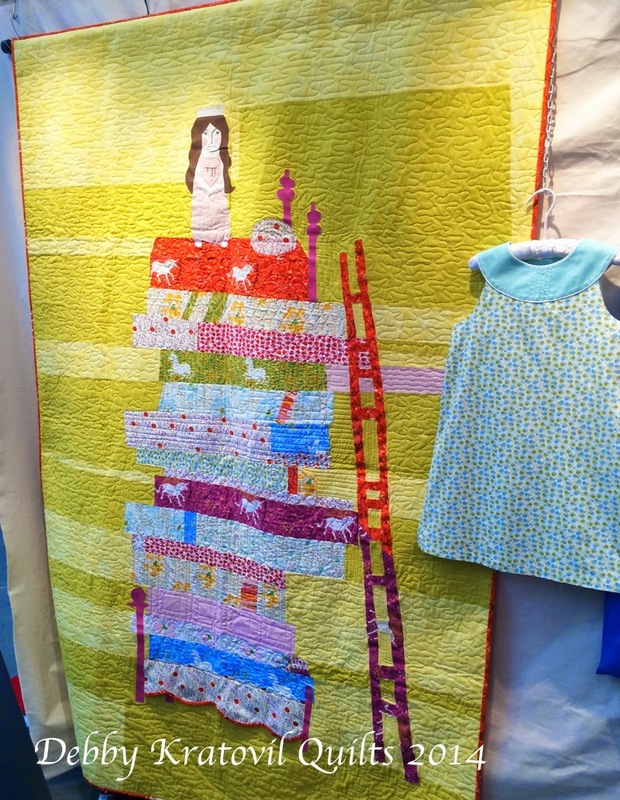 She has a quilt called "Charmville - the Second Wave" that was published in the February/March issue of McCall's magazine. I love it, don't you?!! 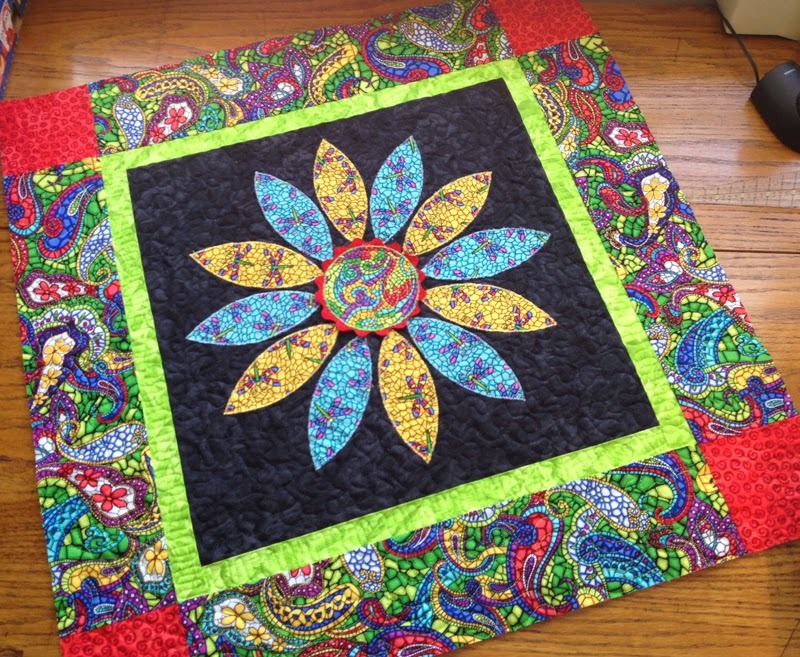 Aby has some very clever tutorials on her blog, as well as a LOT of quilts. 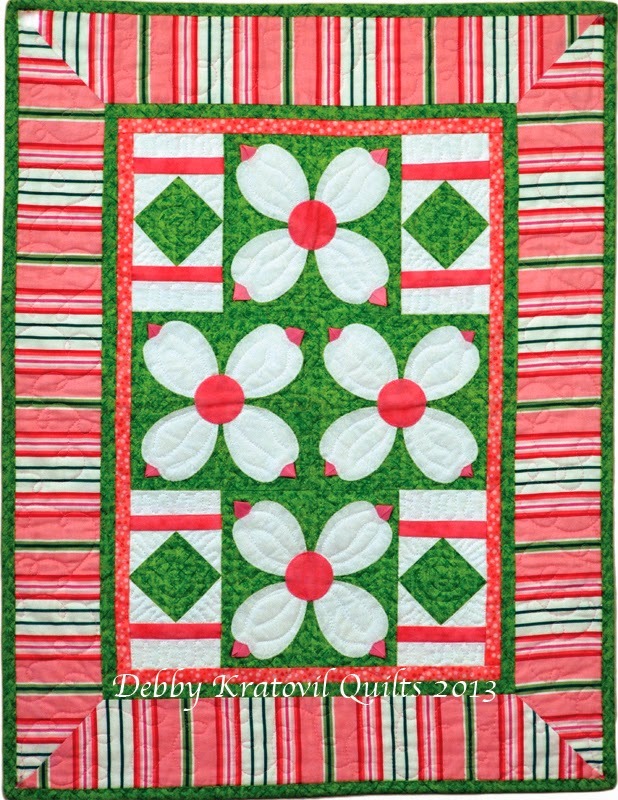 She is a prolific quilter like me; maybe that's why we hit it off so well when we first met. Take a visit to her blog and have a leisurely look around. 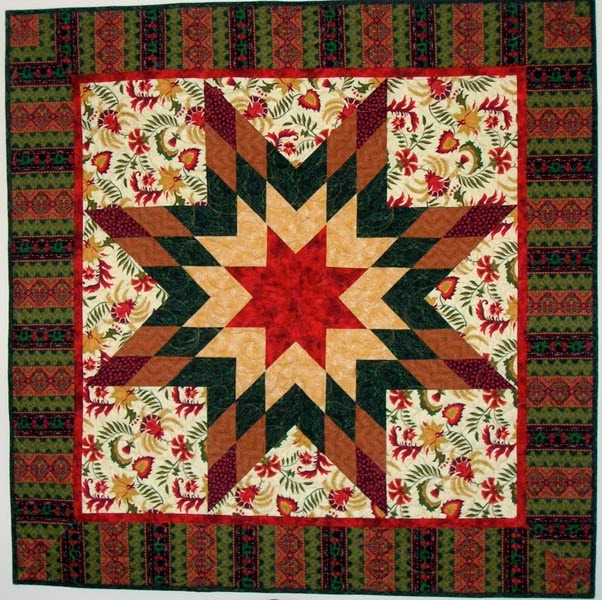 One of my all-time, favorite quilts. 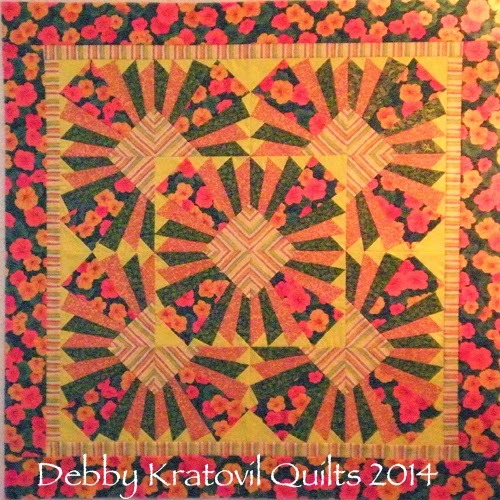 Today is May Day (May 1) and I saw on my 2014 Block a Day Calendar that I had used this applique block for a banner. I was actually recalling when I was in elementary school (in the 1950s - yikes! ), we had May Day celebrations. We had banners around the May pole, wore little costumes and hats. Wow - a trip down memory lane! The dogwoods are about to bloom where I live and they are going to be gorgeous! I love Spring and all the bright greens and new blooms. Sat on my deck this afternoon listening to the birds. Such a luxury for me and I'm going to do it again tomorrow! The bed quilt above is beautiful BUT because it was custom quilted on just about every square inch, it is STIFF AS A BOARD! Beautiful to look at but, I would never give it away - certainly not soft and cuddly. 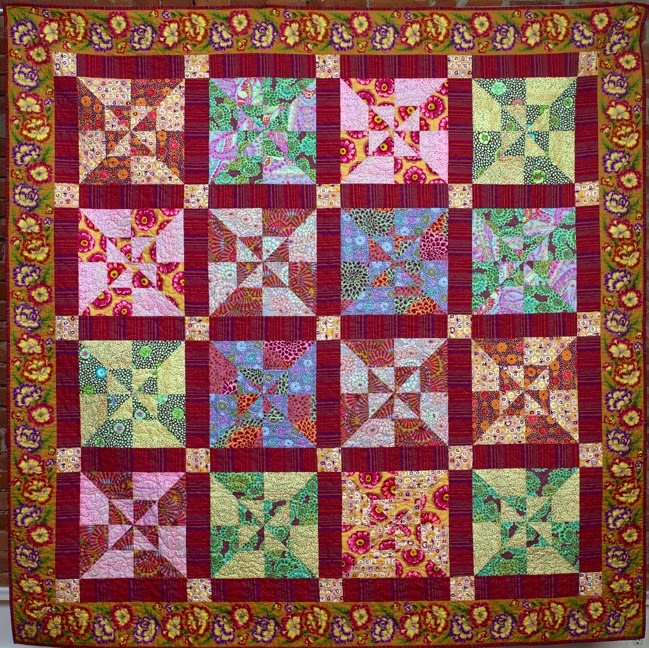 Just a warning - just because a quilt LOOKS beautiful, doesn't mean it FEELS beautiful. Have a great May Day.